With Easter on its way, it is time to start thinking about eggs! Egg Farmers of Canada are celebrating eggs this March with the #Eggsation Twitter Party! 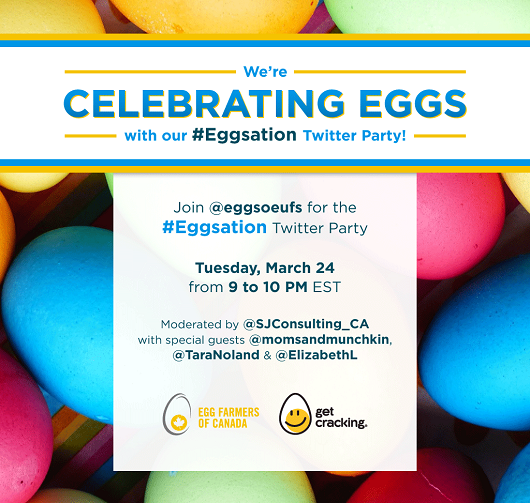 SJ Consulting is pleased to announce that we are holding the #Eggsation Twitter Party on March 24th at 9 pm EST! Eligibility: Open to Canada only. For official rules and regulations, please read HERE. Come join us for some great conversation, prizing and FUN! RSVP below, prizing is open to residents of Canada 18+, excluding Quebec.